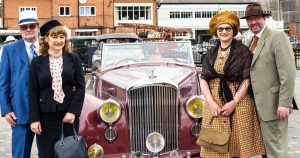 THERE was plenty of “Keep Calm and Carry On” wartime spirit a the Brooklands Museum last Saturday when more than 1,800 people turned up in their vintage finery for the Fabulous Forties fun day. Despite the rather autumnal feel to the day, the stalls were as popular as ever with more 1940s clothes, accessories and memorabilia on offer than in any previous show. There were also vintage cars and war planes on display.